« Is the ICD-10 Delay an opportunity to organize things right? Telemedicine is a fast growing application regarding healthcare treatment wherein healthcare details are moved across the phone or even the Internet and quite often to different networks meant for consulting, and often distant medical procedures or perhaps check-ups. Telemedicine technology is definitely building healthcare industry a lot more interactive simply by implementing the most advanced technology along with telecommunication by offering healthcare services. The market is observing colossal growth because of enhanced remote monitoring of patients. 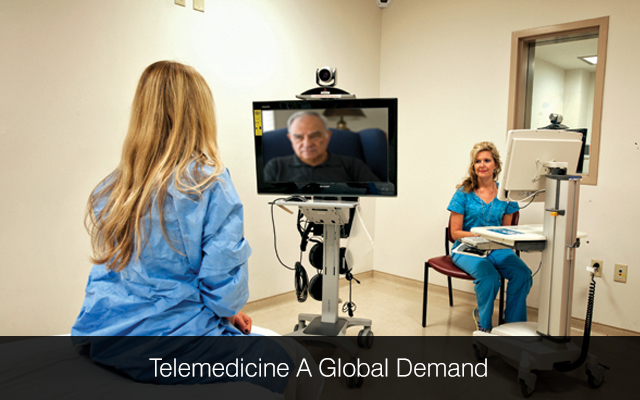 The main idea of telemedicine is to try and abolish the distance aspect in offering life saving medical healthcare. Telemedicine is quite an effective use of communications and also information technologies for any delivery with proper clinical care. Telemedicine could be categorized on the basic upon technology along with services utilized. Telemedicine could be split into three categories remote monitoring, store-and-forward and interactive services. Telemedicine is quite easy for two health care professionals dealing with any case over the phone, or perhaps complicated just as utilizing satellite technology along with Video-conferencing device in order to carry out any instant consultation among the healthcare professionals in two different nations. As per an announcement by the University of California-San Diego Health System the telemedicine pilot program which they launched will decrease wait time in emergency room for the patients. The program is designed in such a way that whenever the ED happens to be busy, it is possible for the doctors to view through video. Cameras will be utilized to carry on-call physicians who will be away from the hospital for the patient in need of help. In such situation, off-site doctors tend to be paged who perhaps remotely link to a telemedicine station to view patients. The telemedicine physician has the ability to examine patient’s eyes, ears, nose, throat and skin, and additionally the doctor will be able to listen to heart and lung sounds with this module. Moreover, laboratory and imaging tests could be ordered and results can be reviewed. According to Adam Darkins, M.D.at M.P.H.M, in VA netwoks “there are around 90,000 veterans have chronic health condition. However, they lead their lives independently at home due to the support of telemedicine. The use of telemedicine during the nighttime could probably be the most beneficial occasions. It is very ideal when used in which physician help and advice is hard to find. Patient care is actually time sensitive as well as service volume might allocated throughout a network. Nighttime telemedicine services are really encouraged by telemedicine within the emergency unit and also in the ICU. Nighttime coverage is generally very challenging for the hospitalist practices providing care around the clock. Hospitalist programs, among a couple of physicians doing work at the same time through the day time, usually minimize staff or man-power during the night starting from 7:00 p.m. Nighttime coverage is normally higher priced or more costly compared to daytime coverage as a result of reduced amount of billable services. A survey by the 2011 Society of Hospital Medicine-Medical Group Management Association (MGMA), revealed that medical expense rise to 30% during nighttime. A lot of hospitals have a problem with nighttime coverage since staff-to-patient proportion tend to be inefficient. In specific circumstances, the quality of care during the nighttime has also reported to become less compared to daytime care. These types of instabilities are definitely unsatisfactory. Rotating shifts starting from days to nights are dissapointing a lot of physicians quite often. Telemedicine is quite often the effective use of communications and also information technologies for any delivery with proper clinical care. Healthcare mobile app development teams can help you build projects within allocated budgets and time schedules. We provide medical software development services. All of our healthcare developers have cleared industry certifications. If you would like to hire healthcare software developers from us, we would be glad to assist you at Mindfire Solutions. This Post was posted in Health Care, Software and tagged Clinical software development, develop clinical information management systems, Develop Electronic Health Records, Develop medical practice management system, develop physician cpoe systems, healthcare software development, healthcare software maintenance, hire healthcare software developers, iphone healthcare app development, Medical Software development. Bookmark the permalink.